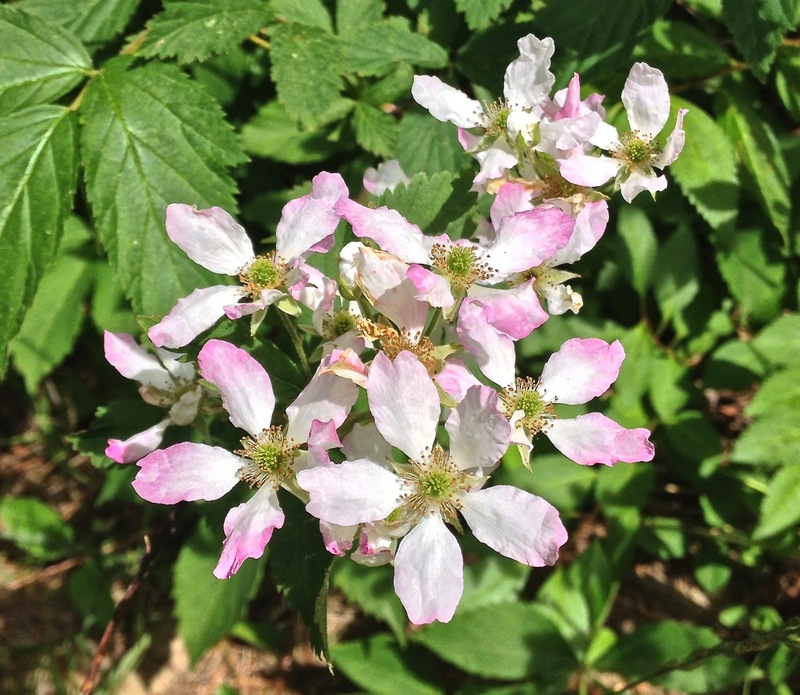 "You can count on blackberry winters to make the berries good," a Tennessee native told me recently. Well, the berries should be good this year, for since my return to Sewanee, TN, we have experienced either a blackberry winter or a dogwood winter. Both plants survived well in the midst of unexpected "cold snaps," as we call them in New Iberia. Temps have dipped into the 40's, and most natives, who have shucked off their winter woolies, are still wearing jackets and warm socks these chilly mornings. I love to see the dogwoods flowering and the butterflies and moths visiting the two trees in my yard, despite the winter-like cold. 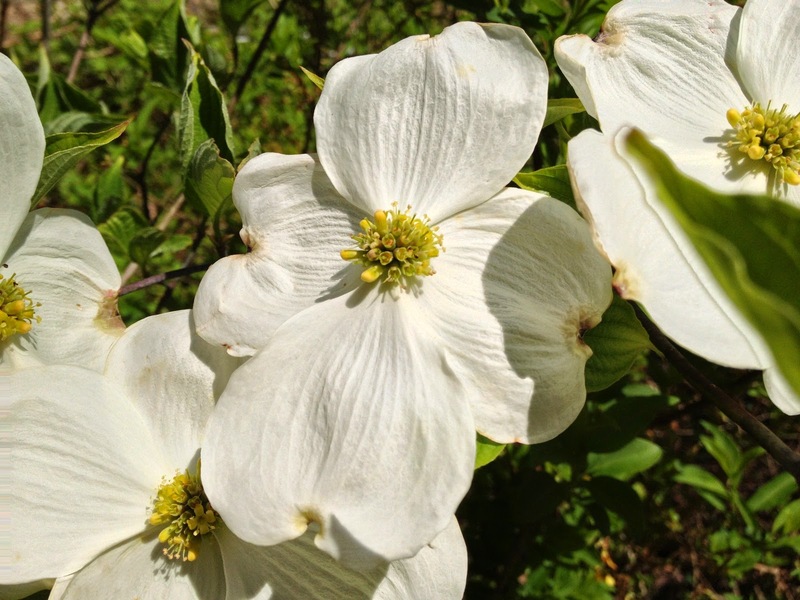 I don't know who would cut down these beauties, but I've read that dogwood is often used for cutting boards, golf clubs, tool handles, and mountain dulcimers. Blasphemy! "Spring has returned. The earth is like a child that knows poems," the poet Rainer Maria Rilke wrote. And every morning, I tune in to the weather channel, hoping that the almanac predictions of more cold for May 9, 10, and 11 will not come about while I chant "Spring has returned." It's time for fireflies to emerge, for the chigger season to begin, and for seasonal allergies to kick in. Lil Pulitzer says that despite the forecasts, we should "live like its spring." So, I went down to the Valley to purchase herb seedlings and plants for the small bed in our backyard. Dianthus, mint, rosemary, yarrow, and sage weathered the bitter cold of a hard winter here, and the Dianthus plants bloom apace. I planted more Dianthus, sage, rosemary, tarragon, and oregano. However, on the heels of the cold temps, heavy rain fell on my new plantings, and I pray that they will withstand the rain and the possibility of more dogwood winter weather in May. My good friend Brenda Lowry of New Iberia, Louisiana, who writes, sings, and records music, sent me copies of Psalms for the 21st Century she's presently composing, and I think that one entitled "Rise" belongs in this rhapsodizing about spring. 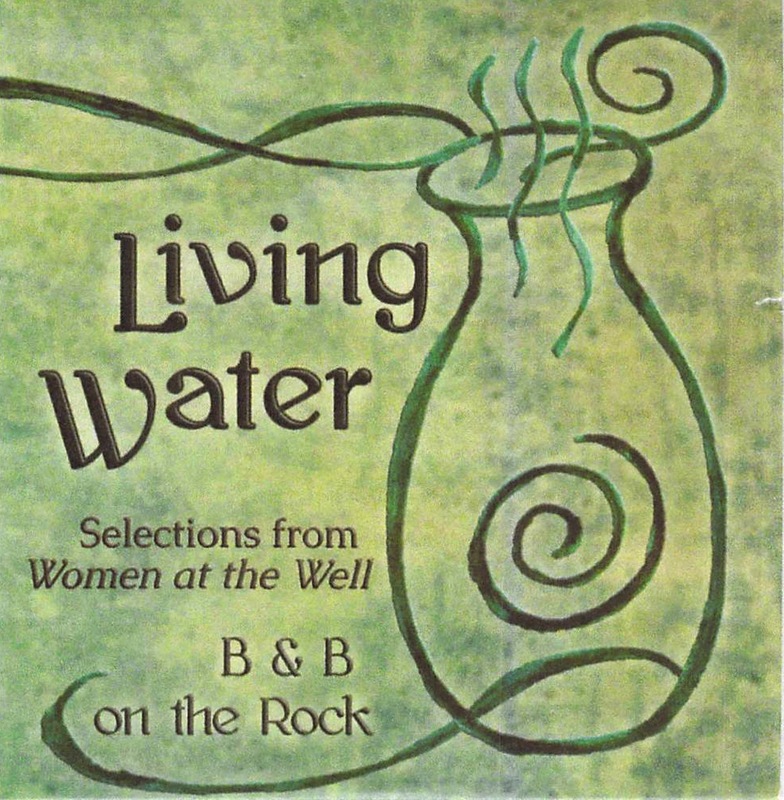 The Psalm writing is a new venture for Brenda, who was recently on the road with Bubba Murrell, performing "Women at the Well," a collection of songs for which they wrote both lyrics and music to honor my ordination as a deacon sixteen years ago. Their road tour took them as far afield as Baltimore, Maryland where they performed at Episcopal and Unity churches before spring arrived. Here are excerpts from Brenda's Psalm entitled "Rise:"
turned into newness as the seasons turn. Rise again, oh Joy, rise again! rise, new life, and fill the world anew. Antiphon. : Rise anew, and bring new hope into the world. By the time I get ready to travel to Sewanee, Tennessee this week-end, I hope that the Louisiana monsoons will have abated and won't follow me, and that all will be dry on The Mountain at my arrival. And by the time I've settled into my Sewanee retreat, A Lonely Grandmother, my latest book of poetry, should have made its debut with Border Press Books. It's No. 40 among my book publications, not counting one lost manuscript of a novel that was put away in an attic and the rats must have consumed (it was my raciest endeavor, so...). The new book of poetry will probably be on the market before my 80th birthday in May. I told a good friend that A Lonely Grandmother has experienced so many birth problems, Grandmother has probably grown lonelier than ever, waiting for her debut. But she's about to emerge, and straight from the publisher's blurb: "A Lonely Grandmother emphasizes that no matter the period in human history, grandmothers have always been important, cherished women in the family constellation. In this volume of poetry, a maternal grandmother calls the poet's family 'a tempest in a teapot,' but is only showing concern for her grandchildren's dysfunctional upbringing. A stern but forgiving figure in the poet's early life, Grandmother Nell comes to realize that "the children grown/Absolutes will not keep her company." This is a poetic tribute to a grandparent that spans a family history from the poet's childhood to adulthood and ends with a meditative prose piece that serves as closure: "She closed the heavy door behind me. When I reached the sidewalk, I looked up at the cupola on the roof of the old house. A phantom flew out of the window beneath it and disappeared in the sky." The beautiful cover of A Lonely Grandmother, which depicts the cupola on my deceased Grandmother Nell's Victorian home in Franklinton, Louisiana, is Vickie Sullivan's photograph of a glass piece conceived and rendered by Karen Bourque, an exquisite glass artist from Churchpoint, Louisiana. Cover design is by grandson Martin Romero, who is a landscape architect practicing in New Orleans, Louisiana. Martin is also an accomplished graphic artist. A Lonely Grandmother is now available online at amazon.com, or from Border Press, PO Box 3124, Sewanee, TN 37375 for $15 plus $4 shipping and handling. A friend in Washington, D.C. who was once a resident of New Iberia, Louisiana recently wrote that she had heard from several sources that Teche country was undergoing some kind of "literary renaissance"—authors were launching their books in all corners of Acadiana. I agreed with her, and yesterday I attended another notable launch by retired District Judge Anne Simon, the book signing of Blood In the Lake. This novel is a legal thriller that combines the author's intelligence, humor, and knowledge of the law and is a fascinating read by a professional expert in courtroom drama. She's also a cogent example of an author whose writing style has been influenced by romantic Teche country: "We could barely see the bayou through the trees—a shimmering stream of dark roast coffee undulating half a football field below the house... The Bayou Teche in south Louisiana casts a spell, an inspiration for poets and a perfectly legal narcotic for the enchantment of those lucky enough to spend time on her shores..."
Blood In the Lake is the second of Simon's crime novels and is a story combining exciting courtroom scenes, moral dilemmas, romance, rich settings, and a line-up of colorful characters. The protagonist, Mandy Aguillard, an intern in the office of a New Iberia District Attorney, is drawn into a hunt for the killer of her grandfather, the patriarch of the Boudreaux clan who is victimized by principals in an illegal drug trade centered near Lake Peigneur. Mandy shows the action of the hunt in a strong voice that creates an empathetic connection to the Boudreaux family, harnessing the plot and moving it forward in well-constructed flow. Mandy becomes romantically involved with Tom Barnett, a District Attorney who is the prosecutor in the case against her grandfather's killer. 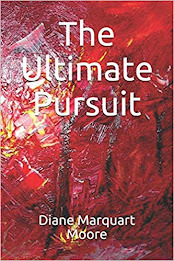 As the protagonist, Mandy provides the reader with a sense of immediacy that builds intense suspense, and Simon handles this expertly, carrying the reader toward impending disaster and ultimately placing Mandy in a dangerous situation that ends in a tragic denouement, which seems right for the story. Simon's descriptions of bayou country involve all five senses, and she treats the reader to strong images; e.g., a nugget of information about Louisiana's Great Egret: "To my left, a Great Egret strolled through the muddy shallows. He stopped. Drawing up one twig-thin leg, he dangled his skinny, three-inch long, coal-black toes above the mirrored surface of the lake. Stretching his neck, he rotated slowly to survey the scene. Satisfied to find everything in order, he tipped his head ten degrees and pointed one beady eye downward into the murky water covering his feet..." Here, geography segues into vivid description without disturbing the flow of the story—the description assists the plot without overcoming the story line. While the major characters in Blood In the Lake are portrayed as investigative personalities involved in the legal profession, Simon also achieves authenticity in her Cajun family characterizations; e.g., a scene with "PawPaw," Mandy's grandfather: "PawPaw loved his coffee hour with the boys. Every morning, around eleven o'clock, he and a half-dozen of his buddies gathered at Thibodeaux's Grocery in Coteau—not another town, just the settlement to the northwest. They tipped back in wooden chairs and propped their boots up on an old pot-bellied stove. The stove would've been cold in the late summer, but it crackled with fire in the winter. The boys at Thib's had very little concern for national or international affairs. Once they'd exchanged information about the height of the sugarcane and the going price for sugar and rice, they moved on to the political maneuvering for the next election. PawPaw would say it used to be so simple to know how everyone stood on the issues and to keep track of who supported who when everyone was either Long or an Anti-Long. Now things were all mixed up. You couldn't predict how a politician would turn out. They'd tell you one thing and do another..."
A long passage about 'Tienne, a family member who had spent two tours of duty in Vietnam, that ends in the poignant words, "I sat there safe under a tin roof and sent them out, one after another—to die," provides a traumatic experience in the story line that nuances the Boudreaux's "personal code" or the "character" of the family that produces the protagonist Mandy. A house fire and injury to a woman living in a trailer on Captain Cade Road near New Iberia, adds to the villainous atmosphere and to the suspicion that a sociopath operates in the quiet countryside surrounding the Queen City of the Teche. Dialogue in Blood In the Lake gives the reader a flavor of regional speech and stands the test of being read aloud. Mandy's voice is especially distinct and helps reveal motives, as well as develops the mood of the novel. She bears out Michael Connelly's adage: "There is a quality of redemption to anything that is true character...where a personal code is forged..."
Simon's experience in the courtroom and her passionate interest in the justice process makes this legal thriller a "must read," and she takes her place in the evolving "literary renaissance" in New Iberia, Louisiana of which my friend in Washington, D.C. spoke. The brilliant cover painting of Blood In the Lake was rendered by Nan Landry, also of New Iberia, and sets the tone for this arresting crime story. Another of Landry's paintings appeared on the cover of Simon's first crime novel, Blood in the Cane Field. Brava Anne and Nan. May your tribe of readers increase! On a return trip from central Florida to New Iberia, Louisiana, we stopped at Marianna, Florida, the halfway mark of a 15-hour journey. We had always stopped short of this town, as it seemed like just another county seat that didn't offer much in the way of "immersion." However, even the Floridian with whom I was traveling was surprised at the attractiveness of the town, a place associated with Spanish Colonial history and settled by Spanish missionaries and soldiers. The missionaries had traveled west to create missions among the Chacato Indians living along the Chipola River. Marianna sits on a ridge above spring-fed Chipola River and offers attractions like several Colonial Plantation homes; e.g., Great Oaks and Erwin House, as well as Queen Anne Victorian houses. As I'm an Episcopal deacon, I was especially interested in the history of St. Luke's Episcopal Church that was burned by the Feds during the Battle of Marianna in 1864. A Bible survived the conflagration and is on display at St. Luke's, a reproach to the soldiers who tried to destroy the church... and the town. The Battle of Marianna has been described as the "deepest penetration of Confederate Florida by Federal soldiers," according to a historian who lives in the town and does extensive Civil War research. 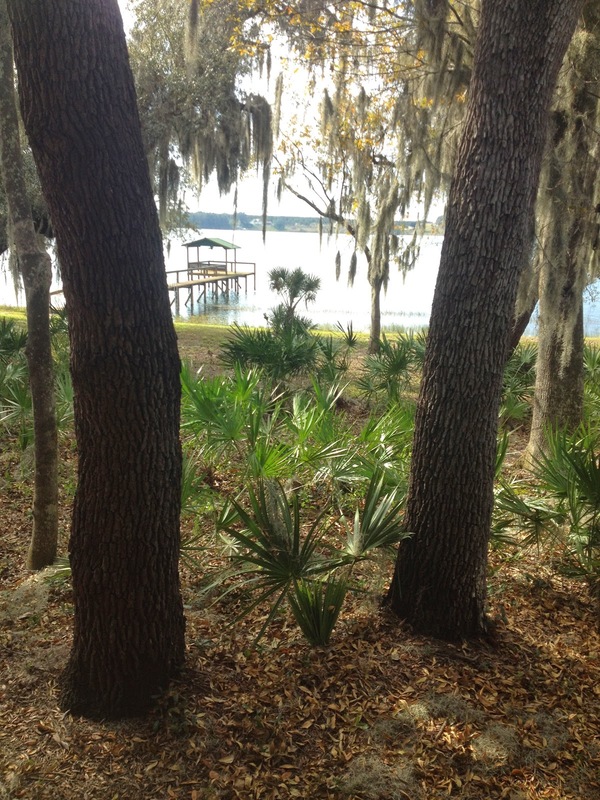 Waterways near Marianna include the Apalachicola, Chattahoochee, and Chipola Rivers, Compass and Seminole Lakes. Birders love the area near Lake Seminole where King rails, purple gallinule and yellow-throated vireo abound. Along the Chipola River, wood warblers thrive, and one bird watcher reported 150 species in a single year. Birders come in herds to see the horned lark, which frequents open cotton fields near the Chattahoochee River. The ubiquitous blackbird was sighted during our overnight stay, and grackles (my favorite) paraded in the motel parking lot. Because we couldn't find the bookstore at nearby Chipola College, I resorted to reading the telephone directory and a visitor's guide published by the Jackson County Tourist Development Council. I was amazed to read that an olive grove flourishes at nearby Alford. It was planted by Don Mueller who retired to Florida after spending many years vacationing in Italy. He established Green Gate Olive Grove (a U-Pick farm) because he discerned that the climate in Jackson County, Florida was similar to the Mediterranean area he visited in Italy. "U-Pickers" clean Mueller's grove out in three weeks during August-mid September. He's the first big producer of olives and olive oil in Florida and has been in the business for six years. Next trip, we plan to visit during U-Picking time. We're told that a variety of Kalamata-style olives are being developed. We missed the Bellamy Bridge, which is reputed to be haunted by the ghost of Elizabeth Bellamy. Elizabeth's bridal gown caught fire on her wedding night, and she was burned to death. I didn't discover why she haunts the bridge, but I surmise that she still searches for water to douse the blaze that set her afire. The bridge is now open to the public under an agreement with Northwest Florida Water Management District, but we didn't stick around to catch a glimpse of Elizabeth's ghost. As I've said before, travelers never know where they'll find serendipity, and the GPS has never alerted us to "places of immersion," but we find them anyway! Gary Entsminger, editor and publisher of Pinyon Publishing in Montrose, Colorado, spends many hours every day encouraging, supporting, and publishing poets. Like Ezra Pound, he believes that "the more every man/woman knows about poetry the better." At some hour during his busy day as a publisher, naturalist, computer programmer, and musician, he manages to write. He has published two novels, two non-fiction books, and numerous scientific articles and poetry in literary journals; however, this month he celebrates the publication of Two Miles West, his first full-length book of poetry, and it is a work of signature brilliance, a dazzling piece de résistance. The cover of this inspiring book features the artistry of Susan Elliott, Entsminger's publishing partner. Elliott photographed and enhanced the "pictographs in the Barrier Canyon Style of the characteristic ghostly anthropomorphs, some six or seven feet tall in the Thompson Wash in southeast Utah." 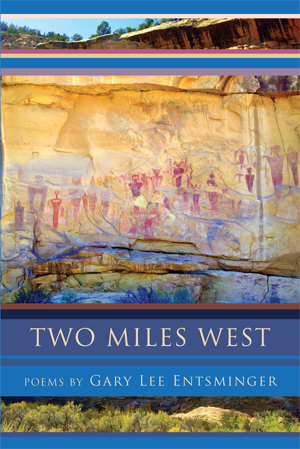 The cover design sets the tone of wonder and awe inherent in the text of Two Miles West. Section drawings of women symbolize the muses or sages mentioned in Yeats' epigraph poem at the beginning of Two Miles West and emphasize the roles various women have played in Entsminger's life; e.g., grandmother, mother, aunt, lover. Perhaps what Entsminger does best in this work is to present a way to understand ourselves and our potential within the context of time and this universe, melding imagination, insight, and wit in lyrics that celebrate surprising moments. In Two Miles West we find capricious explorations into philosophy, music, and nature. The inner "scape" of each poem has a distinctive voice (the evocation of the Muse) that keeps watch over emotional reactions as well as physical impressions of the world two miles west and beyond Entsminger's cabin on a plateau in southwestern Colorado. While reading this volume that contains many metaphysical poems, I was reminded of Ken Wilber's A Theory of Everything in which he presents ideas that invite readers to integrate body, mind, and spirit. This reminder occurred in the poem, "Reading Rilke," in which Entsminger probes the question: "... why weren't/we comfortable/with paradise? /I make a note/as the cottonwood crackles/where are the angels? / we fare no better now/in our interpreted worlds/beneath the higher stars/still as terrified/yet if we beckon/will they reappear/as themselves/and will we recognize/our past echoes in their wings?" Entsminger's poetic questions seem to be designed to cast light upon the hidden and to introduce some measure of light through philosophical enquiry without being didactic. Entsminger's naturalist inclinations appear in the poem "Pelicans," in which he observes the pouches of lady slippers growing in the mountains and likens them to "strangers in a strange land/..." agreeing to nod and make no sound, remaining lady's slippers until they fade in spring "when sunshine bends/and words leaf/then pelicans/leave the ground." Entsminger moves us from level to level, from memory to reality in inspired leaps, from childhood characters to the invented a la Kerouac persona named McQ, and he accomplishes these leaps with images not unlike the pictograph photographs that extend the reader's boundaries, including and transcending along the way. "Music At Three" is a poignant recollection of Entsminger's grandmother who is captured in a "full-cut apron/hugging her wide hips/canvas shoes to ease/sore feet smell [ing] of/onions and fried potatoes/I ask for munie/and dance/snapping fingers/and thumbs where/the beat purses/her lips/as if to kiss/then pinches my cheek/but it never hurts a bit." Brittle wit on the cusp of being idiosyncratic emerges in Entsminger's "Robbery," a poem about the human experience of lost opportunities that expresses the poet's regret from making wise choices (! ): "...I was already up/making plans/to steal a million/we'd rush out/before breakfast/with our haul/mount a bay/and pinto/ride to Colorado/saddlebags slapping/against hair/and skin/until time/caught up with us/with the sheriff's posse our butts/in a sling/should've made love/chile rellenos & refried beans/I could'a been somebody." "Robbery" is a laugh-aloud moment for readers. One of my favorite poems in Two Miles West is a short piece entitled "Feathers" about a nursery rhyme that "has escaped somewhere," a poem that draws the reader in with the delight Robert Frost spoke of as inclining to the impulse, assuming "direction with the first line laid down." In "Feathers," Entsminger "lays it down," imagining two girls and a boy leaving their houses to "run into the woods/live with crows/eat corn get/chased/learn to fly/in time the girls/become crow/maidens and the boy/ a night watch/man with feathers/where his arms used to be." From the initial image of "a nursery rhyme escaping somewhere" (I love that line!) to the end line of "a watch man with feathers/where his arms used to be," Entsminger unfolds a poem that was predestined to achieve the element of surprise, a characteristic of many of his poems. "Metamorphosis" establishes Entsminger's role as a prophet of hope and belief in the potential of men/women despite their preoccupation with "stuff," and their struggles as "wooly bears" "...one day to the next/climbing higher/to just below/somewhere else/soon to become tiger moths." This poem "comes right with a click like a closing box," as Yeats said in his Letters on Poetry. Perhaps the tantamount vision in Entsminger's Two Miles West is that of the possibility of humans being elevated to joy in life while living in a complex, mechanized society. Readers are treated to his appreciation of women, his liberation from time and space limitations, his devotion to truth, and his love of a natural world that presents glad surprises for his poetizing. Thinker, storyteller, a poet who poses questions about the visible and audible world, as well as the spiritual realm, Entsminger emerges as a contemporary version of a renaissance man in this debut volume of poetry. Available from Pinyon Publishing, 23847 V66 Trail, Montrose, Colorado 81403.